Of course I assumed the overturned headstone belonged to Scott M. Jones. After all, written in stone – those very nearby in fact – are references to Helen’s father [S. M] and Mattie’s husband [Scott M], so of course the remaining stone must belong to Scott. Right? But I couldn’t read Scott’s headstone, so I did a quick search on Ancestry. He and Mattie had been married in Cook County Illinois 10 Nov 1894, when Scott was 28 years old and Mattie was 19¹. And as you can see from their headstones, Mattie and Helen died the following year. But as it turned out, Scott survived whatever took his wife’s and daughter’s lives. He went on to marry 29 year old Helen Wright in 1904¹. 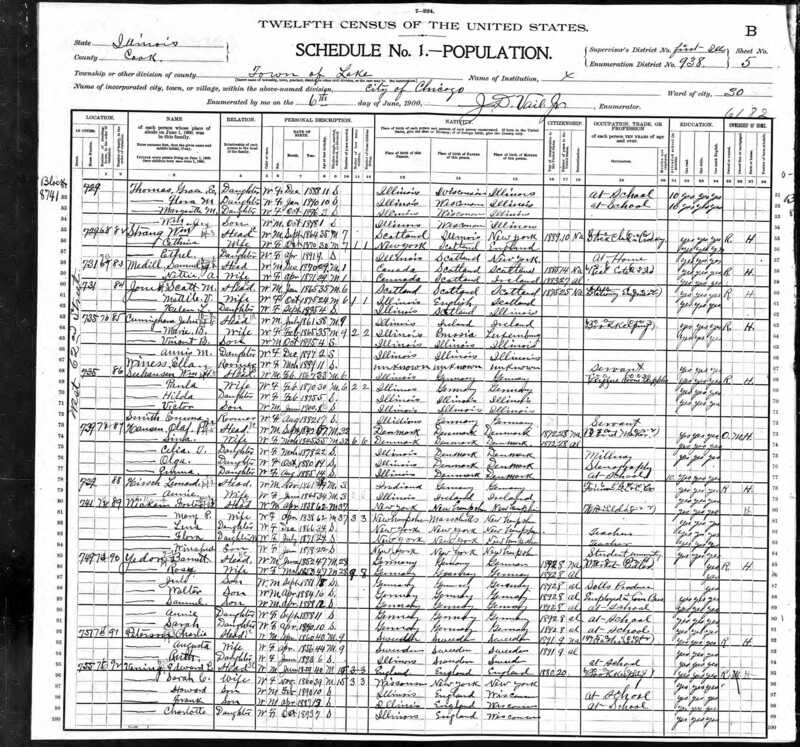 Scott and Helen appeared together in the 1910² and 1920³ census records. I have to admit, I had a moment. Then I started to ponder. 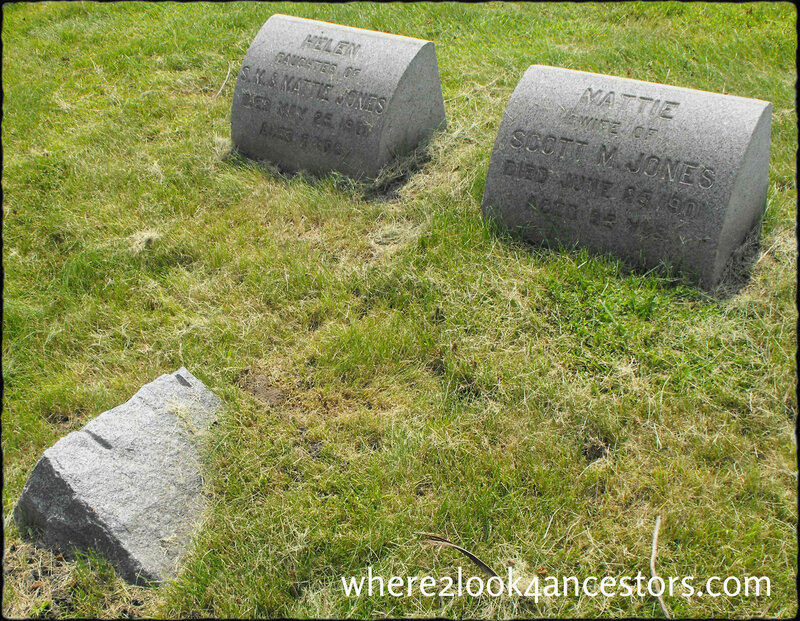 Maybe the third headstone didn’t even belong to Scott. It could belong to that of another child of his and Mattie’s. Or maybe one of Mattie’s parents or siblings. Or even a random person whose stone coincidentally looks like that of Mattie and Helen’s. Finally I decided, as Scott may have decided, that the time had come to move on. ¹“Illinois, Cook County Marriages, 1871–1920.” Index. FamilySearch, Salt Lake City, Utah, 2010. Illinois Department of Public Health records. “Marriage Records, 1871–present.” Division of Vital Records, Springfield, Illinois. I recently had to make that “move on” decision myself in trying fruitlessly to track down a birth record or even baptism record for my 3rd great grandmother. I even contact counties where her parent’s parents were from, thinking perhaps she gave birth at their home or something. Just nothing and it was making me bonkers. For my own sanity, I had to just give up and go on. I could be stuck on that forever otherwise. Oh my gosh – and that’s so hard to do, isn’t it? I console myself in those instances with a reminder that new records are digitized every day. With a little hope and a prayer, maybe one of those records will hold the answers I seek. In the meantime, there are many other ancestors to research.